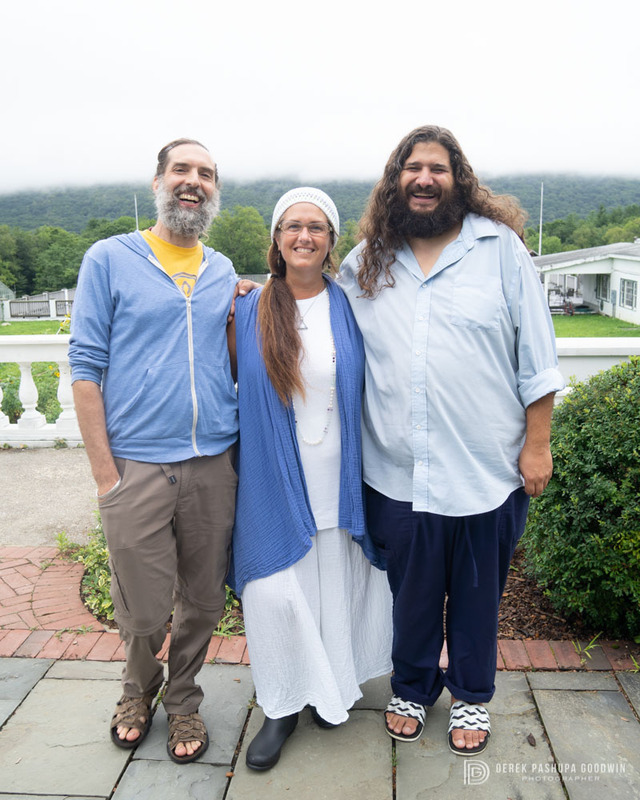 I am honored to have been part of the photography team at this year's Sat Nam East Festival in the Berkshires, my first forray into the world of Kundalini Yoga. As with any initiation, there were many trials and tribulations, making the spiritual rewards even sweeter. Siewli with a Yogi Bhajan quote, "In life, you have to bounce with joy." One of Siewli's nickname's is "soul joy." 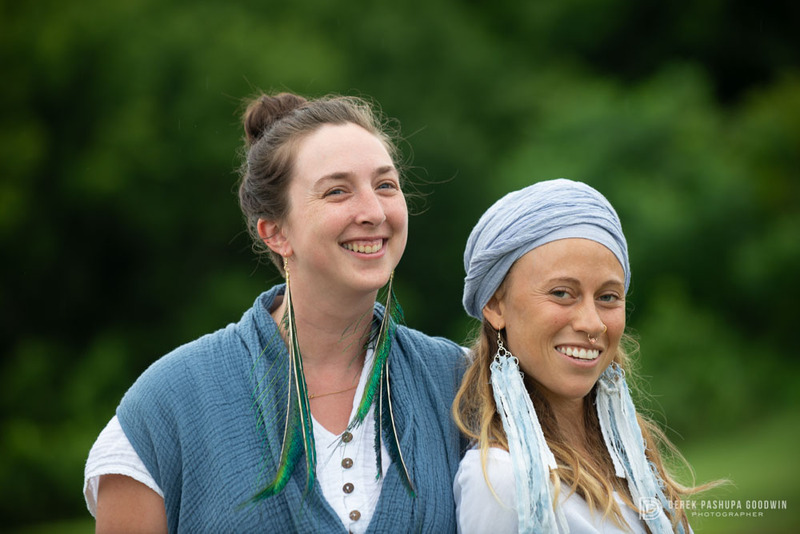 The Kundalini Yoga celebrated at Sat Nam Fest flows from the lineage of Yogi Bhajan, whose quotes were displayed on colorful signs scattered around the campus of the Eastover Estate and Eco-Village where the event was hosted. The Kundalini Yoga of Yogi Bhajan, as I understand it, combines teachings of Sikhism with elements of Patanjali's kriya yoga system: discipline (tapaḥ), spiritual study (svādhyāya) and devotion to God (iśvarapraṇidāna) (Patanjali's Yoga Sutras, II:1). Sat Nam is from Sanskrit, sat meaning "true" and nam meaning "name." 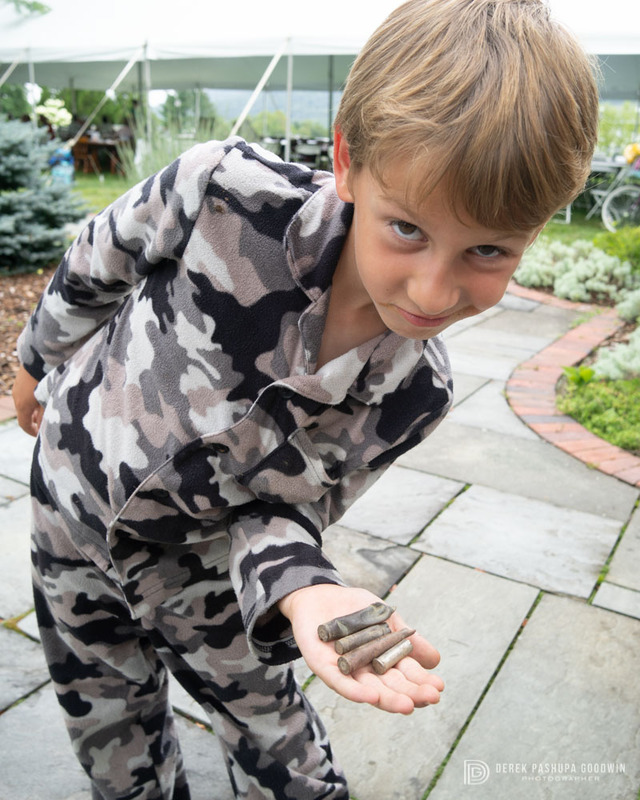 According to the festival's website, "Sat Nam is often translated as ‘true name’ or ‘true vibration.’ Sat Nam is also translated as ‘Truth is my identity.’ Sat Nam is often referred to as a “seed mantra,” a mantra that resonates with the wisdom that says within the seed is contained all the knowledge of the fully grown tree. So, when you plant such a seed within your consciousness, over and over and over again, your soul awakens and you are given your destiny." 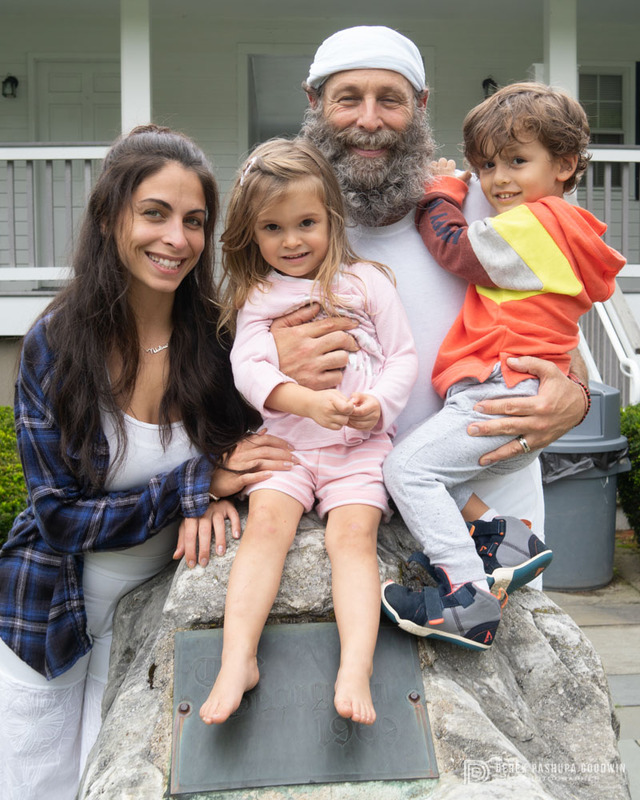 My partner Siewli and I had scheduled a shuttle from Brooklyn to the Berkshires on Friday morning at 8 a.m., but sadly our driver had an accident with a deer that delayed the tip for several hours. After the five-hour drive we arrived as the sun was setting and were visciously attacked by mosquitoes while we set up our tent by flashlight. 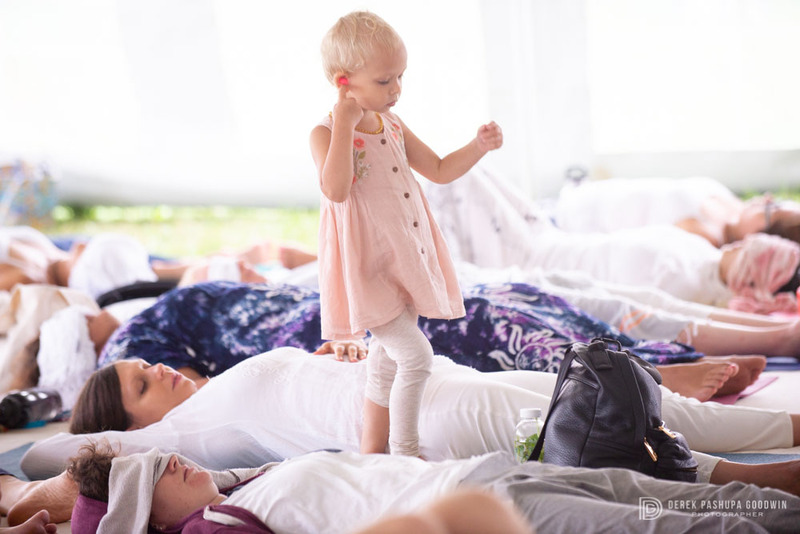 Once our tent was set we visited the Long Time Sun Apparel and grabbed some beautiful white outfits so we could blend in to the sea of Kundalini yogis dressed in white. As the yogis poured out of the main tent we realized we had missed the entire day of activities! On the positive side we made some new friends, Meika and Casey, who I photographed the next day in and around the LTSA booth. 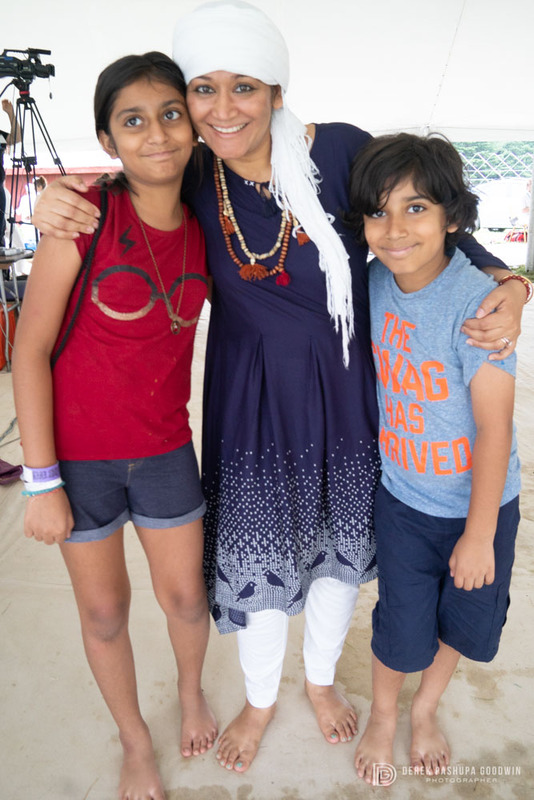 One of my favorite experiences at the festival was meeting Snatam Kaur. As a musician interested in sacred chants I am aware of her music and familiar with a couple of her recordings, which are gentle and upliftinh. Siewli and I had gone to see her once in NYC when we were gifted tickets, but we were in the balcony and she was unrecognizeable. Her voice was much more familiar to me than her face! It was just before noon on Saturday and I was walking through the mansion where the dining hall was located, and noticed a male Sikh standing in the doorway looking out at the misty landscape. It was photo worthy so I quietly composed and took a couple shots. The next thing I knew a young girl ran into his arms and he picked her up to his chest as she hugged him. Another beautiful moment captured. He gently lowered her to the ground and then they both looked out into the mist. Next a Sikh woman with an umbrella came, and they turned to come in and saw me with my camera. The woman asked if I would mind taking a family portrait, and I said "of course!" I went outside so the beautuful diffuse light would shine on them, all love surround them, and captured a gorgeous family photo. As we all went back inside, I asked the woman her name, and as you guessed, it was Snatam Kaur. So many blessings in those few moments! One of the joys of photographing Sat Nam Fest was getting to witness Gurmukh Kaur Khalsa teaching a yoga class. 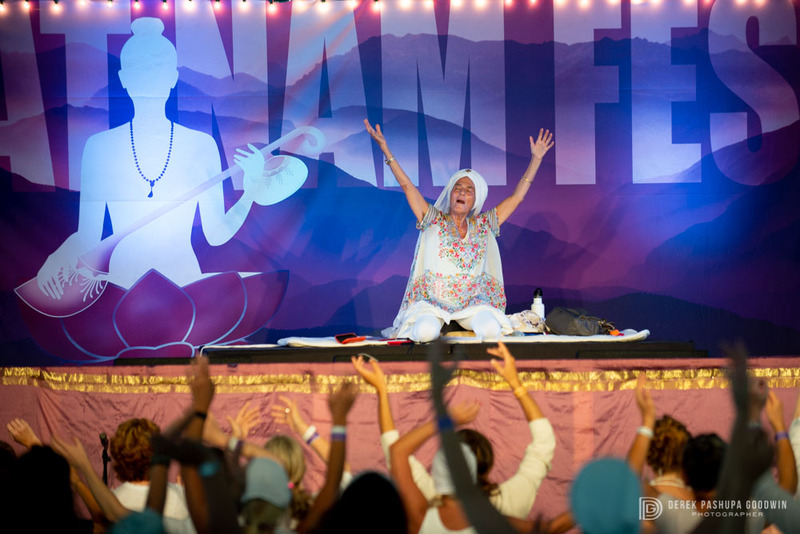 At 75, she is one of the top teachers in the Kundalini lineage and in the yoga movement as we know it in the west. She and her husband Gurushabd founded the Golden Bridge Yoga Centers in Los Angeles and NYC. She is also known as a pioneer in pre-natal yoga and leads the Khalsa Way Prenatal Teacher Training. A little side note, lest you mistakenly think Gurmukh Kaur Khalso and Snatam Kaur are biologically related. Kaur is a middle or last name used by Sikh women. The male equivalent, Singh, is derived from the Sanskrit word for lion (सिंह siṃha). According to Wikipedia, "Sikh principles believe that all men and women are completely equal. Therefore, a woman... does not need a man's title to raise her own status." 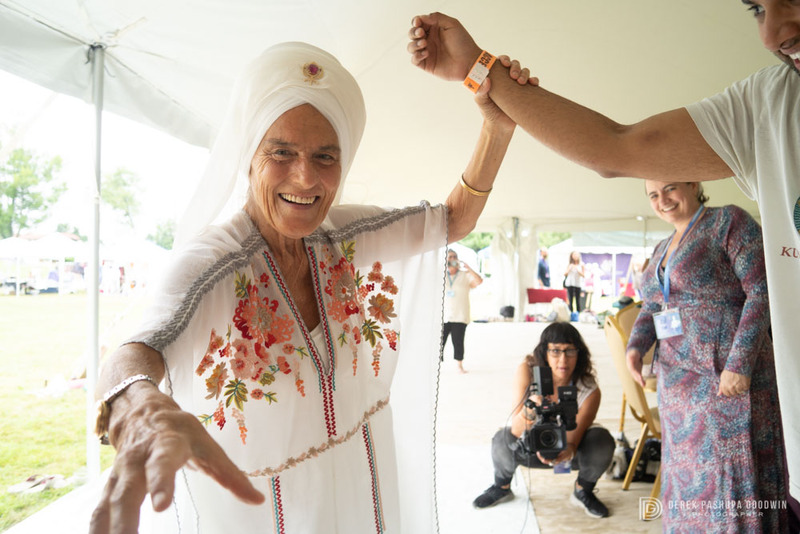 A favorite teaching I picked up from Gurmukh as she had students bowing repeatedly to a mantra from her music playlist; "Let your body be a pendulum. Hypnotize yourself into oneness." 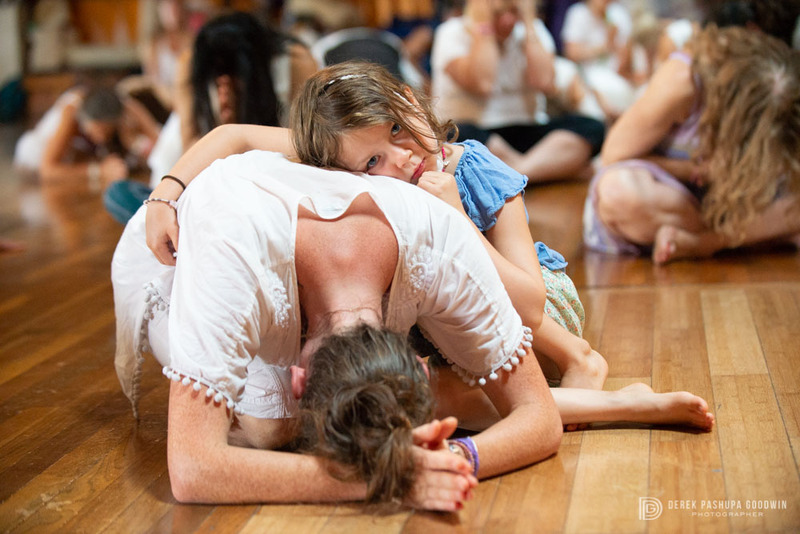 The photos below are from Gurmukh's classes on Saturday and Sunday. 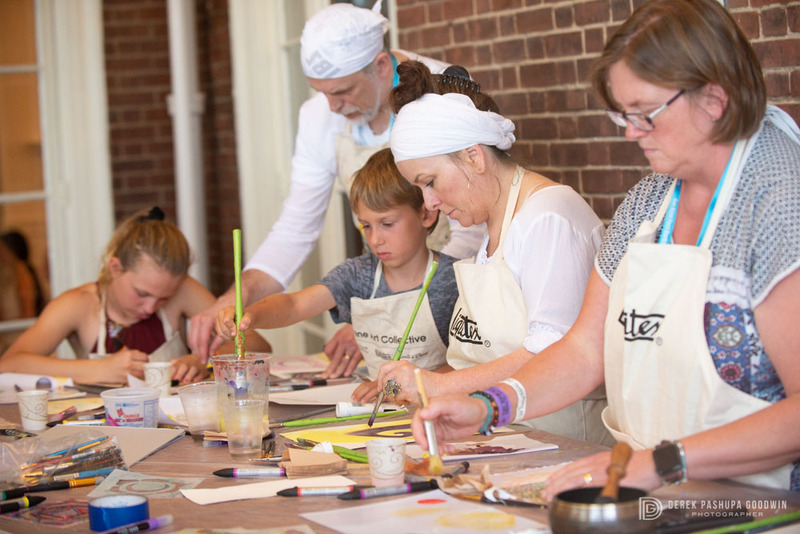 I first encountered Harnam while he was teaching "Painting a Personal Mandala Workshop." I have been interested in mandalas since exploring the writings of Carl Jung in the 90's, a path that eventually led me to Buddhism and Yoga. I was intrigued by the class, but only got to witness a few minutes before I was off to capture the next event. 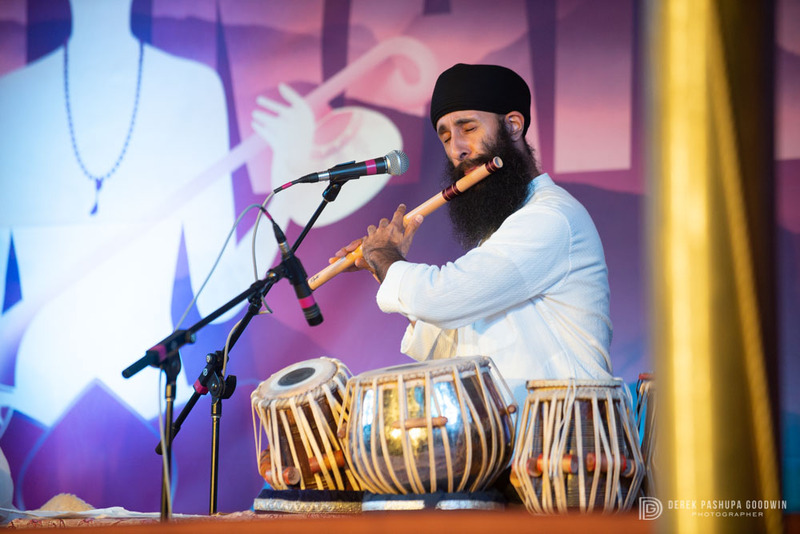 I bumped into Harnam a little later and we struck up a conversation in which I learned he is also a kirtan musician and painter. A kindred spirit. I immediately felt a connection to his openness and authenticity. As the event was winding down I invited him and some friends he was chatting with to pose for a group portrait, and love the results below as he burst into laughter over over a shared funny. The main reason I got involved in Sat Nam this year was that some of my dearest friends were working in the kitchen. It was my friend Jason's second year, and on returning this year he brought some more friends from our crew; Megan, Adam, J.P., and Veronica. 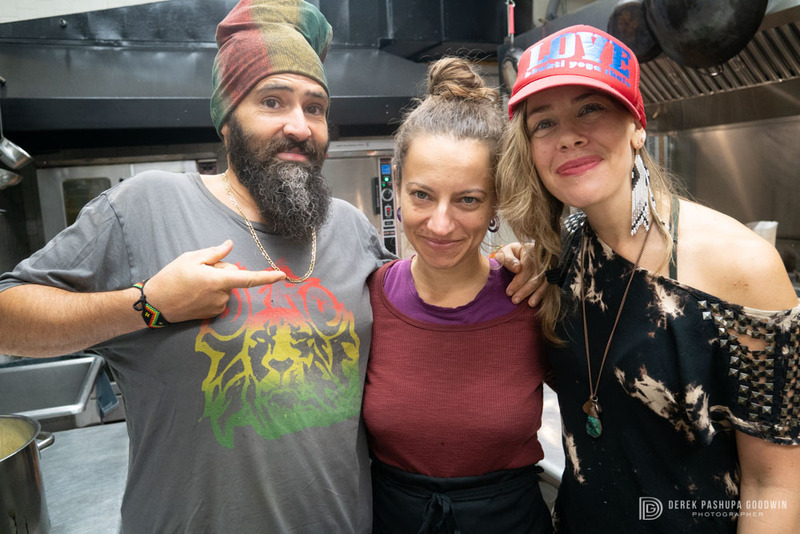 They all worked for the maestro of the kitchen, an amazing and humble chef named Katie. 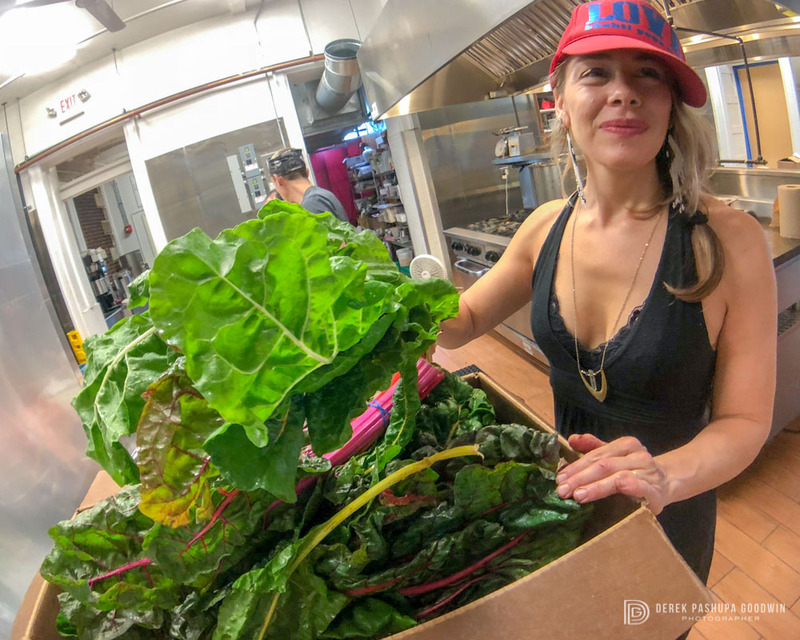 My kitchen friends are all vegan, and with the exception of some cookies, everything I saw come out of the kitchen was vegan and gluten-free. Not only that, but it was all delicious and I overheard many delighted yogis rave about the food. Knowing they would all be working at Sat Nam, I emailed the festival and as luck would have it, they needed an extra photographer. I got hooked up with another amazing Katie (Katie Clark), who led the photo team. I grabbed a few shots of the kitchen as part of my seva. When I saw Wah on the schedule at Sat Nam, being a yoga teacher appreciative of the kirtan movement, I incorrectly assumed she was the Wah! I had witnessed at other kirtan events. Little did I know, there is another Wah. As Lao Tzu is known to have said, "The Wah that is known may not be the true Wah." Now that I am becoming Kundalini literate, I see that this Wah has Khalsa as her last name, similar to Gurmukh. According to Wikipedia, "Khalsa (Punjabi: ਖ਼ਾਲਸਾ "the pure") refers to both a special group of initiated Sikh warriors, as well as a community that considers Sikhism as its faith." Sikh and you shall find. It turns out that Wah is Sanskrit for "wonderous," and is part of one of the favorite mantras in Kundalini, Waheguru. 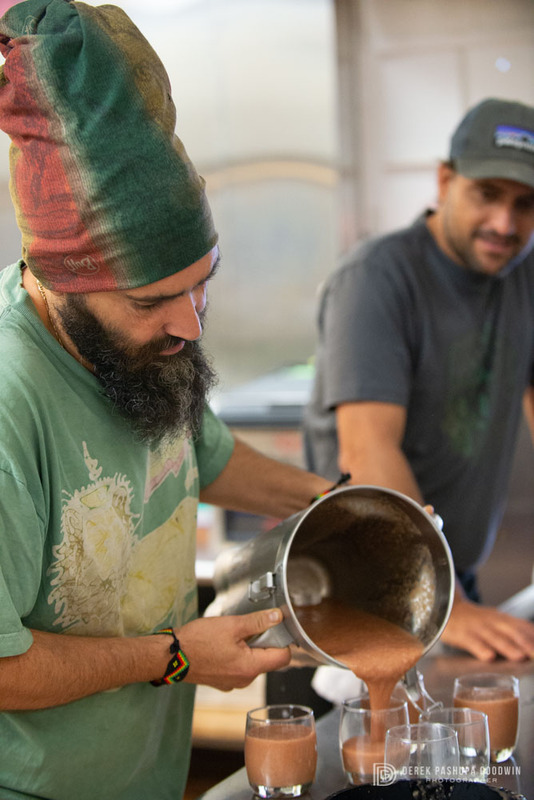 The Healthy, Happy, Holy Organization (3HO) founded by Yogi Bhajan explains the mantra thusly: "This mantra expresses the indescribable experience of going from darkness to light—from ignorance to true understanding. It is the Infinite teacher of the soul." 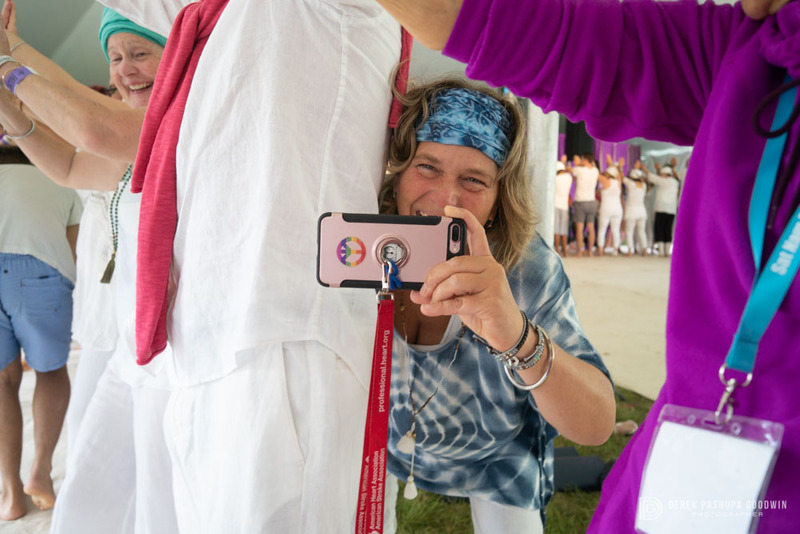 All that being said, Wah's Kundalini Dance to “Release Your Past” workshop was a definite highlight amongst participants. Siewli loves nothing more than to dance, and she came out of the room all aglow. She may have even released parts of her future. These photos capture a bit of the Wah vibration. I am Womb-Man, hear me ROAR! There was a time, not so long ago, that I was living in a male-centric world. I was a stagehand, working with a bunch of grungy dudes, speaking in vulgarities as men sometimes do, and passing gas audibly without remorse. Then I became a vegan and started doing yoga, and that world slipped away from me like grains of sand in the hourglass. Nowadays I have to actively seek out male connections, as I am constantly surrounded by women. Oh poor me, I know! 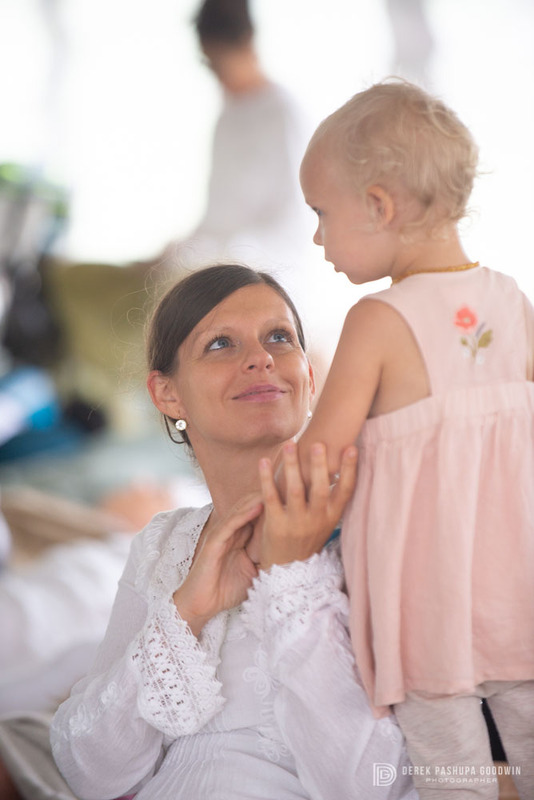 Against this backdrop of my life I was not surprised when I received a text telling me all the afternoon events were being covered by other photographers, and could I please go photograph the Womb-man: Returning to Wholeness women's workshop with Sukhdev? "Oh sure," I said, "as long as they will let me in!" It turns out that I was not the only guy in the room. There was also the sound guy and the guy playing drums in the band, Akah Jackson (together Sukhdev and Akah make up the duo Aykanna). Maybe because of that fact, the secrets that I suspect women are keeping from us were not revealed in the workshop, unless maybe in coded phrases like "intuition" and "empowerment," which I heard used several times. It is the mystery between the polarities that keeps the world turning; I am happy to remain partially in the dark as to the ways of women, until that day we all return to wholeness. Happy just to be surrounded by goddesses and humbled by my hum-man-ity. BTW - while I am mansplaining Kundalini names and terminology, the given spiritual name Sukhdev means "Angel of Peace." Om Shanti. 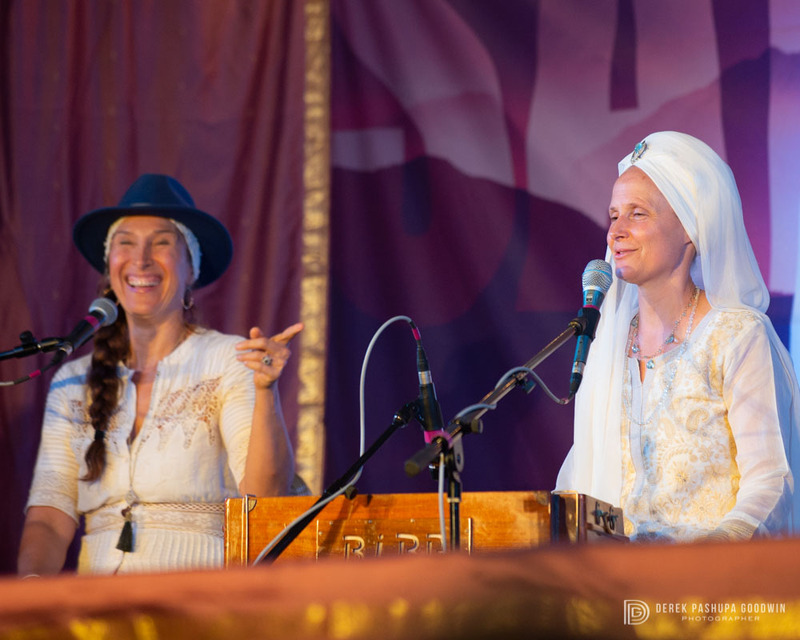 The grande finalé on Saturday night was a performance by Snatam Kaur. My legs were tired from running around, and I was happy to lay down next to Siewli and a couple of our new friends to soak in the sounds. The highlight of the night for me was when Snatam's guitarist Stuart Fuchs busted out a ukulele for the final two songs. The last song was the classic May the Long Time Sun Shine Upon You, written by the Incredible String Band and popularized by its use in Kundalini closing ceremonies and class endings. It was a psychedelic folk song from the sixties and became a favorite of Yogi Bhajan, which led to its inclusion in the Kundalini repetoire. Lyrics: May the long-time sun, shine upon you. All love surround you. And the pure light within you, guide your way on. Guide your way on. 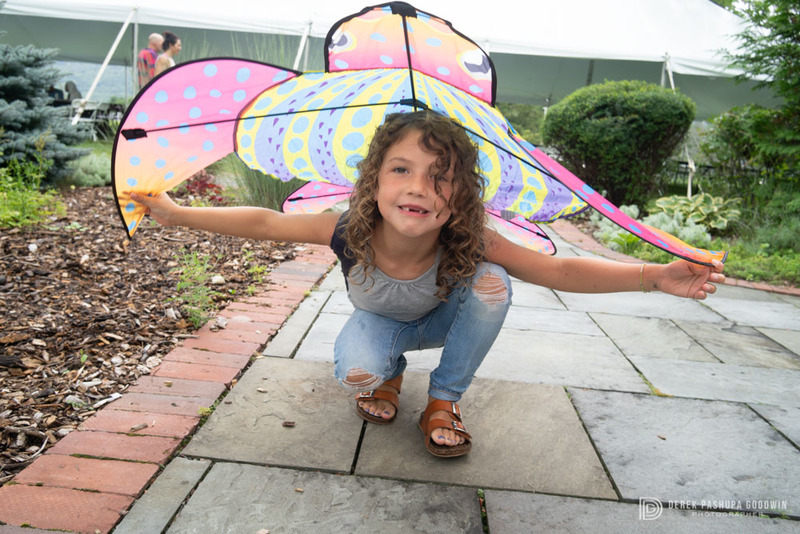 While I was working my shutter-button finger to the bone, Siewli was dancing, taking workshops, supporting the vendors, and making new friends. 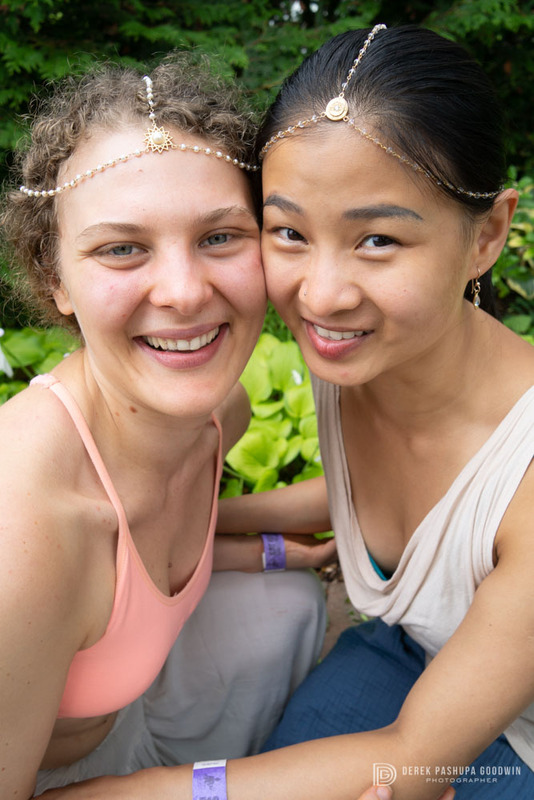 We got to meet lots of amazing people, many of them first-time Kundalini fest visitors like ourselves. My final gallery for this blog is dedicated to them. May the long time sun shine upon you all! Sat Nam! Wahe Guru! 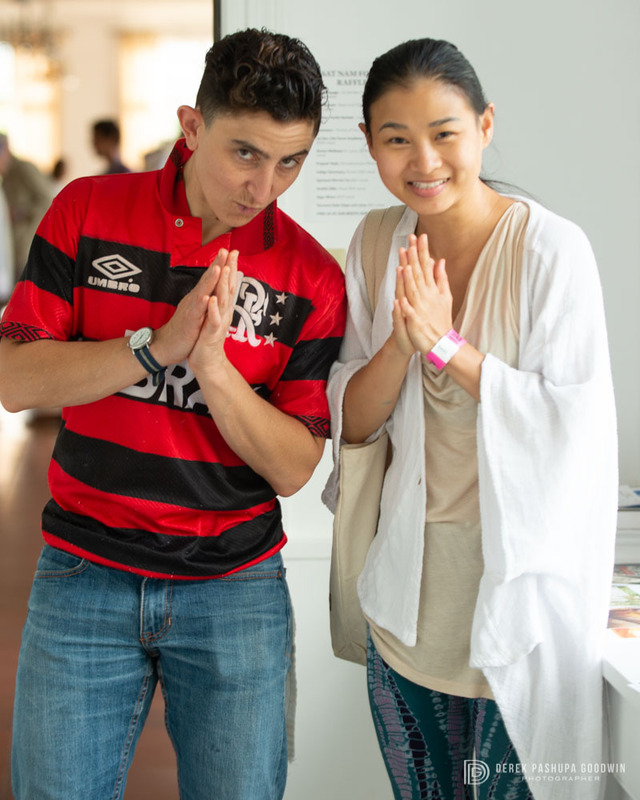 Check out my Entire Sat Nam East 2018 Photo Gallery!